Specially designed to check ground leakage currents, the DCM305E is an efficient and highly versatile instrument. It has six ranges 6 mA, 60 mA, 600 mA, 6 A, 60 A, 100 A with a minimum resolution of 0.001 mA on the 6 mA range. Its upper range also enables TRMS AC current measurements up to 100 A. The DCM305E is ideal for measuring the ground leakage current in a circuit where the RCD keeps tripping out unexpectedly. The measured result will quickly identify whether the earth leakage current present is excessive, causing the RCD to trip, or if the RCD itself is over sensitive or faulty. 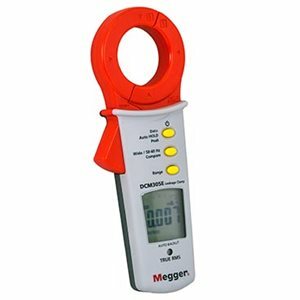 Additionally, this clampmeter vastly improves measurements on circuits with harmonics/electric noise on the cables using a low pass filter of 50/60 Hz. Safety is of the utmost importance and with that in mind, the DCM305E exceeds the latest safety design standards IEC1010-2-32 and EMC requirements through a series of safety features that provide you with a safer working environment. Other key functions include the “Data Hold” feature which aids in measurements where there is a problem with accessibility or poor lighting, and the automatic power off feature that extends the battery life.